This is exactly what’s wrong with your approach to this exercise: have you no regard to Rule 5 (1) (c) : “A Boundary Commission may take into account, if and to such extent as they think fit—boundaries of existing constituencies”. As West Sussex is geeting 8 seats, and currently has 8 seats, and as Worthing has been split since 1997, then this is pointless. 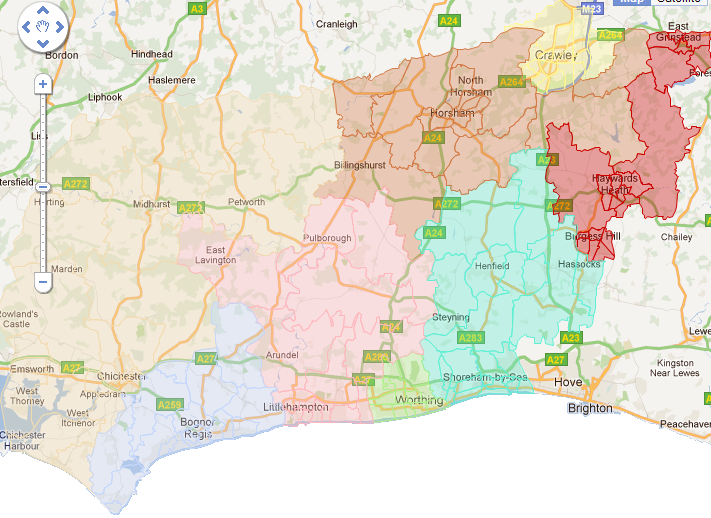 West Sussex need something like three or four wards swapped to get the seats within the quota. I oughtn’t to care, but this ex cathedra announcing that you, the great Soho Warrior, have decreed West Sussex shall be like this, in complete deliberate ignorance of the rules, the Commission’s own initial proposals, and proposals made by the parties at public hearings you were probably at, gets on my wick. It’s not just some interesting parlour game, you know. Keep your hair on! I haven’t decreed anything, I’m just making suggestions. If you don’t like any of them I’ll happily refund your subscription fee. Anyway, the Commission has been given special dispensation at this Review to ignore current constituency boundaries, so it’s a good opportunity to put some ideas up the flagpole. The policy of minimum change (which is obviously supported by MP’s, since it’s in their interest) can lead over time to the pattern of seats in a county becoming deformed. At previous reviews, local people have sometimes expressed a preference for a more radical overhaul because they can see instinctively what the pattern should be. In areas like Sussex which I know very little, I’m only demonstrating how counter-proposals might look, in order to aid people who don’t have the tools to do so. It’s patently obvious from some of their recommendations that the staff at the Commission know very little about many parts of the country, so I make no apology for throwing my hat in the ring, and nor should anyone else.